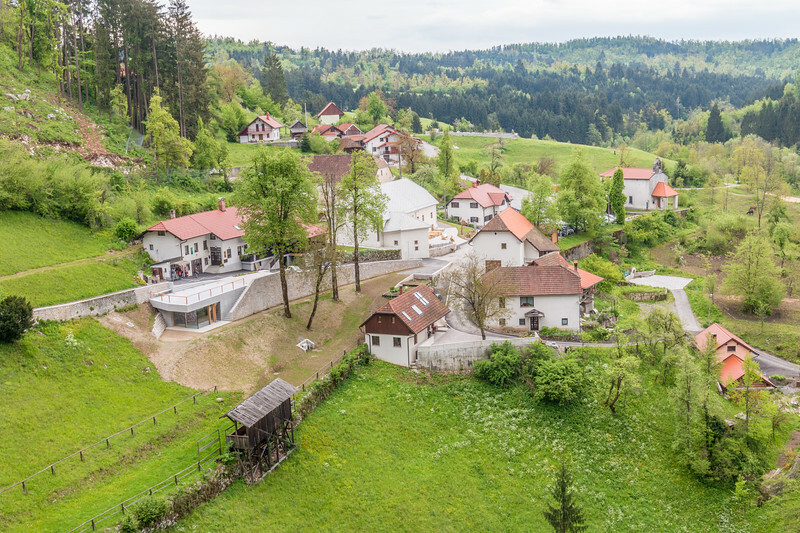 Slovenia is a small country packed with stunning outdoor places to visit such as mountains and lakes, yet some of the most notable natural features are underground – the caves of Slovenia. The southwestern part of the country is a well-known karst region and its limestone plateau is home to a subterranean world with countless caves. 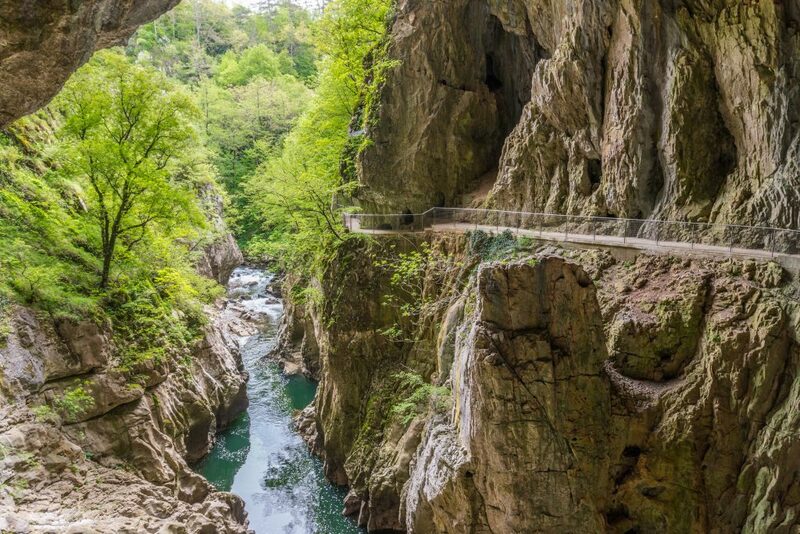 Two of Slovenia’s best-known caves are Škocjan and Postojna, with the first being a UNESCO World Heritage Site with a massive underground canyon and the latter a popular tourist attraction with its own rail track. 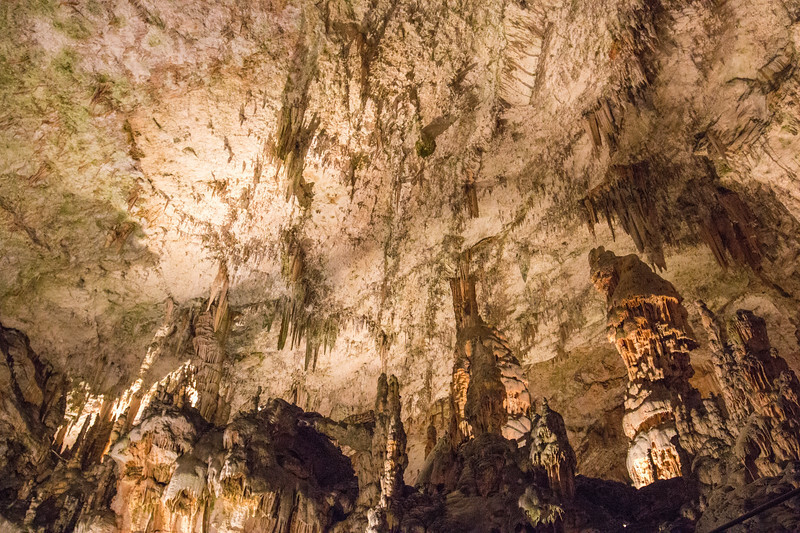 Both have no shortage of stalactites and stalagmites, creating a spectacular display that thoroughly deserves to be seen. While on a road trip in Slovenia, we spent a day exploring the karst region, stopping not only at Škocjan and Postojna but also at Predjama, a unique cave castle. These 3 places are not far from each other and make up for a very interesting day out in the country. 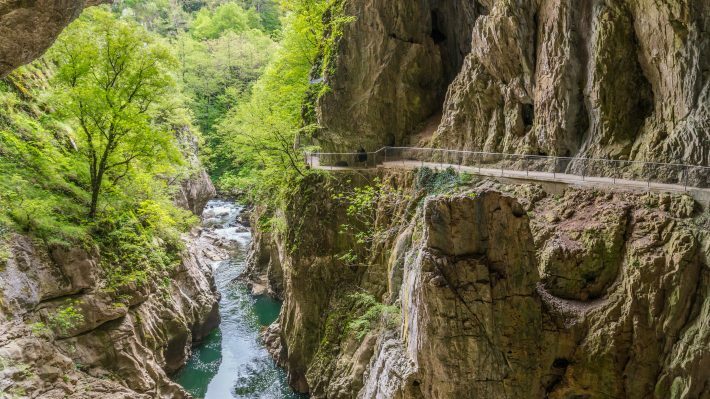 Škocjan’s cave system is a must-see while in Slovenia for a number of reasons. 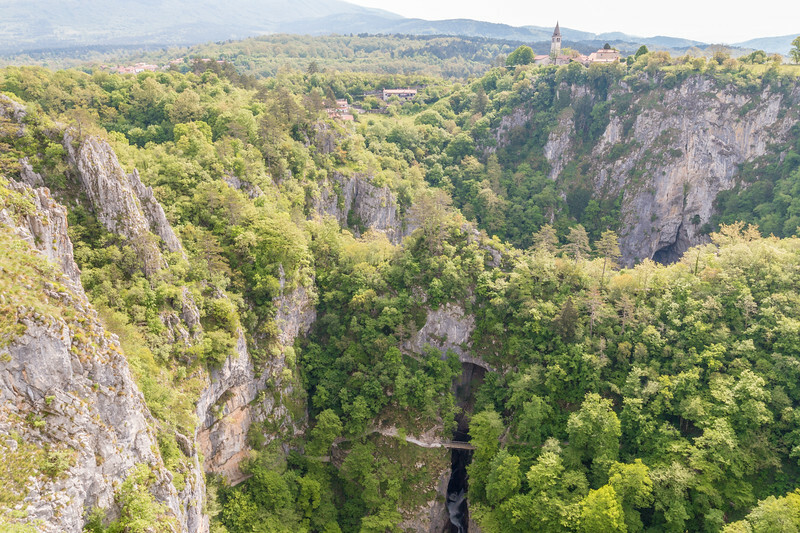 The 6 km of caves carved by the Reka river include one of the largest underground canyons in the world, waterfalls, deep dolines (sinkholes), and the usual stalactites and stalagmites. Definitely some of the best caves we’ve been to, plus, Škocjan’s doesn’t get as much hype or visitors as Postojna. There are 3 possible itineraries to explore Škocjan and we recommend doing them all. One overground and free which is a short walking loop to observe the karst landscape and two underground that go inside the caves and require a ticket. You can opt to buy a combined ticket to visit both caves. Make sure you look at the schedules before going so you can do both without wasting too much time in between. 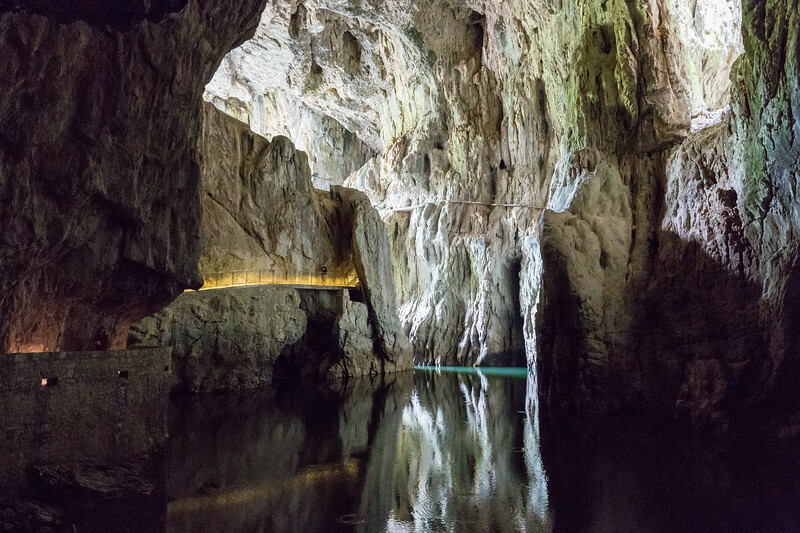 One intriguing fact about Škocjan and the Reka river is that the latter disappears into the depths of the caves and resurfaces near the Adriatic sea. This is the short trail of 2 km that will take you through the beautiful karst landscape just above the caves and offers spectacular panoramic views of the collapsed dolines, Velika and Mala. We did this while waiting for our scheduled tour to start, and because it doesn’t take too long it’s a great option for your visit to Škocjan. The trail also passes by Škocjan village, which sits on top of the caves. 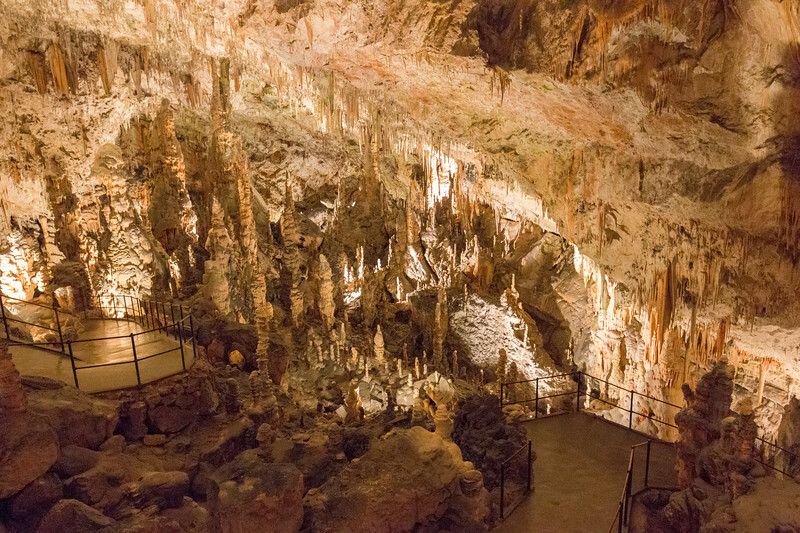 This is the main tour of the Škocjan caves and it gets busier than the other two options. As the name suggests, it goes through the same path as the underground canyon, but first it starts off at the Silent Cave, which is full of stalactites and stalagmites, including some rather impressive ones. The underground canyon section is known as the murmuring cave and is 110 m high, unquestionably very impressive to witness as we walked the path which stands some 50 meters above the water in some parts, and includes crossing a small bridge that is barely suitable for those afraid of heights. You can also see the old path for tourists further down the canyon – which looked way too dangerous. Unfortunately, we have no photos to show as they were not allowed. It’s understandable because light conditions are very tough and in order to take decent photos one would have to use a tripod, which delays the tour and makes it more difficult for the guide. We wish they had specialized tours for photographers. The tour lasts just under 2 hours and ends at the collapsed doline with a funicular ride up to street level. A much shorter but equally interesting tour that lasts around 1 hour, it follows the Reka river as it goes underground through the cave entrance. It’s a much brighter cave that allows for some photography and privileged access to one of the collapsed dolines, the natural bridge between the two, and the big waterfall. We had a special guest for this one, a cat that bravely followed our small group all the way. And now, we have some photos for you guys! Postojna is a very famous and the most notorious of the caves of Slovenia. Tourists first visited this cave at the beginning of the 19th century, and the current infrastructures that surround the cave have grown considerably to accommodate all the visitors, which attests to the popularity of Postojna. While this “touristy” feeling is not necessarily bad, it certainly is a very different experience compared to Škocjan. 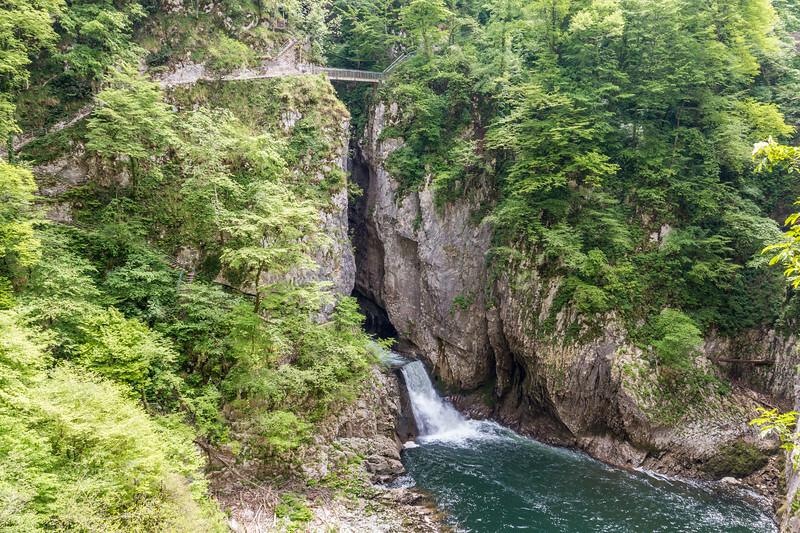 In our opinion, visiting Postojna is well worth the time and the ticket price. The cave really is a show cave, with rooms full of stalactites, stalagmites, and columns in all sizes and shapes. What makes these structures so incredible is the fact that it takes 100 years for them to grow just 1 cm. Now imagine how old these things are! 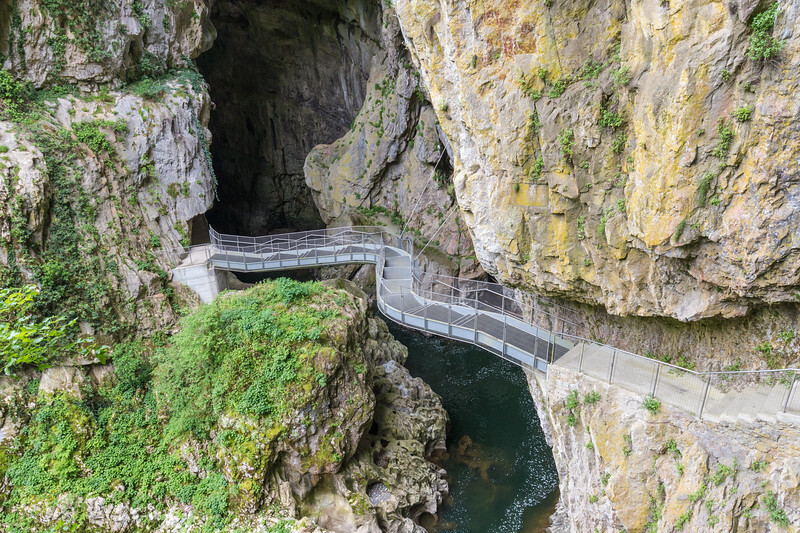 With about 24 km in length, Postojna cave is huge but only 5 km or so are open and prepared for visitors on a guided tour of 1h and 30m. One special thing about Postojna is that there’s rail track inside, which everyone takes to start and end the tour. This small train has been running for 140 years and it is probably one of a kind. It made the tour feel even more interesting. Throughout the slow paced visit, the guide highlights the main structures and their friendly names. This subterranean world is home to quite a few endemic species fully adapted to the cave conditions, namely the otherworldly proteus which is known as the human fish because of its resemblance in color to humans. It can live up to 100 years! There are a couple of places where you can see the human fish: the aquarium inside the main cave and, if you want to see more, the Proteus Vivarium, an exhibition about the proteus and other cave-dwelling species. 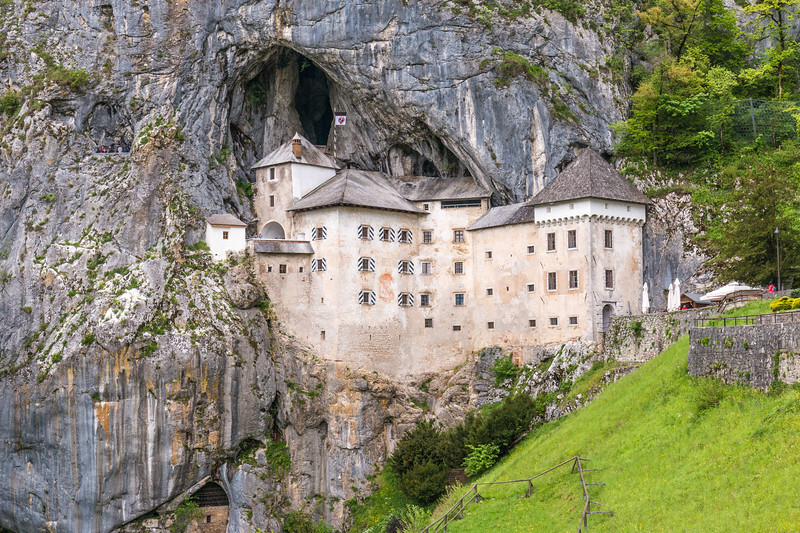 Predjama castle is one of the most remarkable places in Slovenia, as you can see from the picture below, and leaves everyone staring at it in awe. A unique castle embedded in a 120 m high cliff at the mouth of a cave, certainly a great feat and the perfect example of symbiosis between nature and a man-made structure. It was built 800 years ago and it has proven to be an impenetrable fortification ever since. 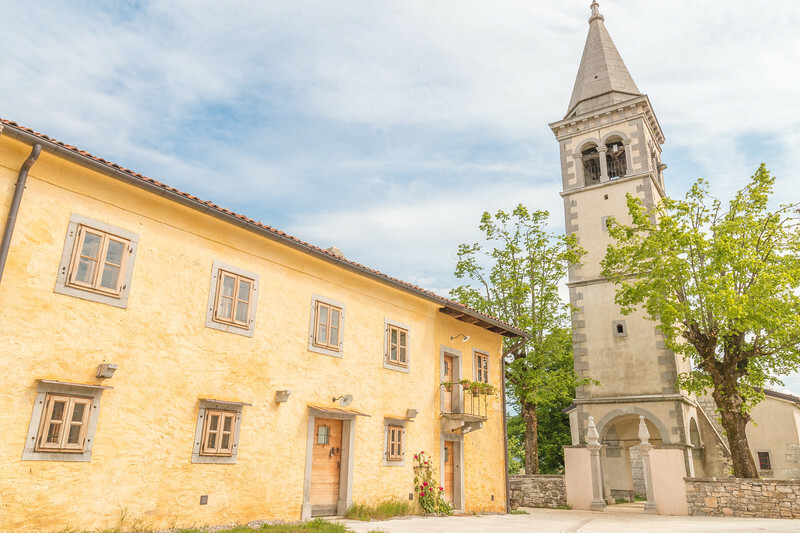 Visiting the castle doesn’t take long and you can do it independently and opt for an audio guide which tells a bit about the history of Predjama. Plus, it’s not far from Postojna caves (9 km on an easy road) and there are combined tickets at a reduced price. The highlight of a visit to Predjama castle is clearly the exterior and the inner parts that “connect” with the cave, really interesting to see. Not to say that the other rooms are not relevant but they definitely do not compare to the rest of the castle. If there’s one room worth seeing though, it has to be the armory. The medieval weaponry is fascinating. There is also a cave under Predjama castle that can be added to your ticket but we didn’t visit it this time. It’s useful to know that the cave is closed during the winter months due to a colony of bats and their hibernation period. Temperatures inside the caves despite being constant throughout the year are quite low, just around 10 °C. It’s a good idea to dress warmly and to wear appropriate and comfortable shoes as it gets quite slippery in some parts of the caves. 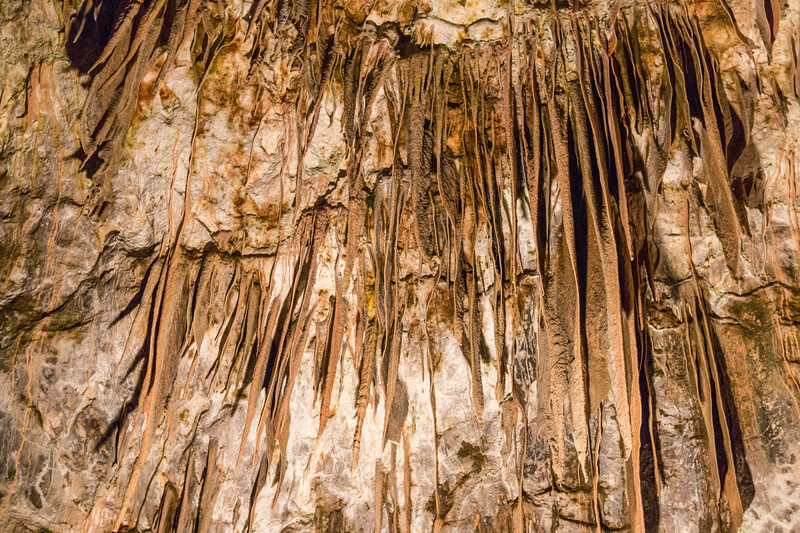 Plan your day around the schedules of the tours of each cave so you can make it there without rushing from one place to another and don’t forget to buy the combined Postojna ticket. Have you been to the caves of Slovenia? Let us know in the comments below. This is awesome! I can see from your photos and text why doing all 3 routes is the way to go! We have never heard of this area, but it looks like something we would love to check out. 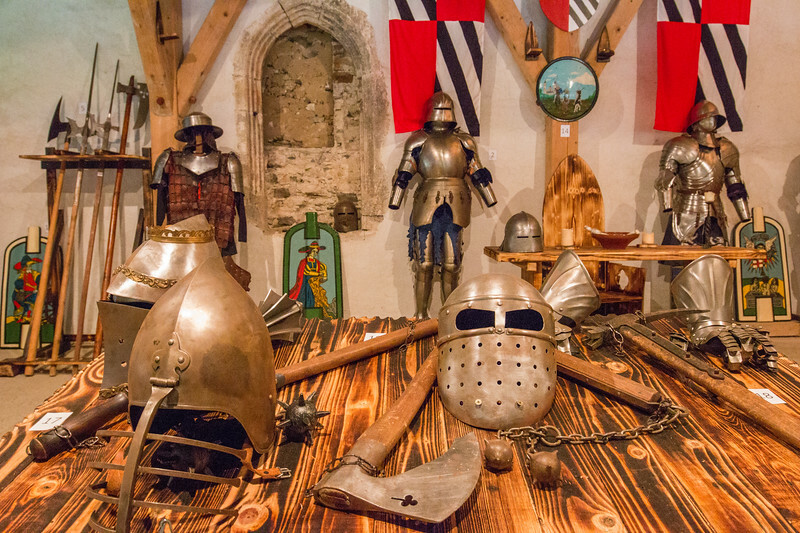 Love those caves, as well as the Medieval armor – very cool! We used to live about an hour from this part of Slovenia when we lived in Italy. We’ve been to Predjama and both caves multiple times as it’s a unique spot to take visitors when they come. The cave that runs from the castle to the show caves at Postojna is interesting but be prepared to get absolutely filthy. It’s a real spelunking experience. Your photos make me want to book a trip to Slovenia right now. So many beautiful places to visit and explore. The underground caves at Skocjan are incredible! Great post. What a wonderful adventure! I love cave trails and that castle would be amazing to walk through. It reminds me of the cave dwellers in the Southwestern United States although their rudimentary lifestyle was far from as sophisticated. Very cool. Thanks for the well written post. We will be driving through Slovenia this fall and now plan to visit this Karsten landscape. These caves and Predjama Castle are a trip unto themselves. What a fascinating part of Slovenia. It seems there are still so many areas of this country that are undiscovered. I’d love to visit. What a beautiful place to explore. Your pictures are amazing and very inviting. The castle in the rock is fabulous.I haven’t visit Slovenia but I hope to get that chance anytime soon. Thanks for sharing these pictures ! Ah I am so bummed I didn’t get to visit the caves last summer when I visited Slovenia. It’s such a beautiful country isn’t it?! Wowww… underground caves always fascinates me. Never read about such places do exist in Slovenia. Would love to visit someday. Silent cave sounds interesting and the church looks beautiful. O yes i was and is beautifuland FASCINATING…. Slovenia is a small yet breathtaking country, Hugo and Cristina! Definitely worth visiting!